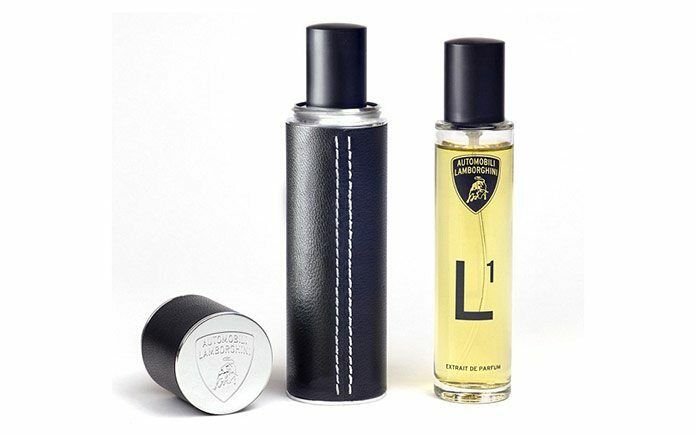 L1, the first scent Collection from Collezione automobili Lamborghini. Renowned luxury car manufacturer Lamborghini have launched their very first fragrance, a scent that’s both bold and exclusive in character. L1 stands out for lime, ginger, leather, musk, pepper and tobacco tones, with a little touch of vetiver. Only 999 bottles of the limited edition scent have been made to launch the Huracan LP 610-4 at Geneva. The other three fragrances are set to be launched in October this year. The packaging, created entirely by hand in Italy, is itself a synthesis of mechanics and design. Lightness, performance and elegance styled in aluminium, Alcantara and leather. A carrying bag in Alcantara, inspired by a car tool pouch, holds the precious aluminium tube, brushed by hand, formed in one piece and masterfully covered in black leather. Two glass 25 ml refills hold the precious extrait de parfum. L1 is for a man with a cosmopolitan lifestyle, who loves performance and professional and personal challenges, who loves to travel, and who seeks out essential and exclusive luxury.